I’ve used Rootsmagic 3 for a few years now, and have been singing it’s praises ever since. I started out with the trial version which allowed you to explore the features, but there was a limit on the size of the database. It was the most user-freindly program IMO with easy to follow instructions and a lot of features. I liked the Rootsmagic 3 features for sharing, making cds, charts, reports etc. in different styles, as well as a website builder. I like the fact that it is compatible with other programs as well. I was eager to find out what Rootsmagic 4 offered that the earlier version didn’t, so when the Beta offer came, I took advantage of it. One of the first features I found was the Rootsmagic-To-Go, which can be installed on a USB drive and carried with you, to use on any computer, how handy is that? No more going to the library and taking notes and scanning files to be taken home and entered into the program, now you can enter data right into the program, wherever you are. When you get home, you can just synchronize your files and update automatically. I love this feature. With the earlier version, I had the program on my USB drive, but it wasn’t installed on it to be of use, I had to install it on a computer and open the rmg. files I stored on the drive to use it. It was mostly for back-up. I like the new Media Gallery too, you can see all of the images in your file at once, and edit or delete, print, see the source of the file and all associated records. Another feature that was improved upon was the editing. It was okay on the previous version, but there were two different windows, with the new version, the editor is just one window. I like the Index column too, I use the “search person” feature a lot so I don’t have to open a new window now, it’s right there, all of the time, or it can be hidden if you prefer. There are more web search options with the version 4 program as well, with version 3 you could search LDS records and Ancestry. With Rootsmagic4 there is an address bar to search any site. I just updated my website a couple of months ago, but I’m looking forward to next time I update it with the new version, I wonder how different it will be, maybe I’ll see what changes are there, I can preview the website in a browser and see how it will look and work, without creating the site. I think I’ll enjoy the new features of Rootsmagic 4. Is Your Birth Date Genetic? The date of your birth should be totally random, but is it? How many people in your family share a birthday with another family member? I was asking myself this question today, since March 22 is my niece’s 20th birthday, my nephew’s 14th birthday and my grandnephew’s 8th birthday. I started thinking about the date, the 22nd of the month. I found this to be a popular day to give birth in my family. My older brother was born on September 22nd, my son was born on January 22nd and my grandnephew’s first birthday was February 22nd. That’s six family members born on the 22nd of the month, half in the same month. There were a lot of close calls too. My granddaughter, nephew and niece were born on the 19th, one niece, one nephew, one grandnephew on the 21st. That’s 12 out of 40 family members that were born between the 19th – 22nd of the month. I think that’s more than coincidence! Quite a few of my family members share birthdays also, my oldest son and my niece , my nephew and grandson, my nephew and my dad, my grandson and my grandmother, my grandfather and me. My brothers and sisters and I have a theory about all of the September births among us, first three of seven, the seventh one was late, October 4th. Our theory is that it’s nine months after Christmas, and when they were first starting out they didn’t have much to spend on gifts for each other, and the last one was because they had six mouths to feed and didn’t have much money to spent on gifts for each other. COG #69 – What if….the British won the Revolutionary War? What if…Moses Doan’s message was read by Colonel Rahl, instead of being stuffed into his pocket to be read later…would Washington have surrendered? “Doan and the British suspected that Washington might attack Trenton but they had no idea when, and felt confident that the British and the Hession reinforcements there would prevail. Moses and Abraham were in Newtown on Christmas Eve day and noticed that preparations were underway for marching the troops. They also noticed ferry barges assembling near McKonkey’s Ferry (Washington’s Crossing, PA). Actually, in the weeks prior, General Washington had ordered that all the boats North and South of the ferry to be confiscated for their use or destroyed. Moses sent Levi with this news to General Grant via New Brunswick and then returned to his Jericho Mountain cave and planned to scout the rebels the following day. That morning he disguised himself as a local farmer and took Old York Road. towards New Hope. He passed the Buckingham Friends and eventually took the Ferry Road to Coryell’s Ferry. It was here that Moses saw that the troops and usual sentinels were gone and preparations were being made to dismantle the fortifications. He rode to Bowman’s hill where the main rebel encampment was and realized that something very big was happening. At this time a Nor’easter had begun to blow and sleet and snow were falling. Moses suspected that the rebels were heading for Trenton and knew his only chance to help the British was to warn them himself. He went north past Coryell’s to Howell’s Ferry which was run by a loyal Tory. There he crossed the ice choked river in what had become a raging storm.. Securing a horse, he rode south into the near blizzard. The howling wind, the pounding of the river and cracking of the ice floes was incredible as was the near zero temperature but he kept on. He encountered no one on the road and considered turning back, thinking he may have been wrong about the Americans’ intentions. In an incredible historic moment, as he passed the embankment across from McKonkey’s (now Washington Crossing), he heard and saw the rebel barges filled with soldiers pushing through the blizzard towards the Jersey side. He was now sure that their objective was Trenton. Moses Doan was, at that moment, in possession of one of the greatest secrets of the war. What if the British had stopped Washington at Trenton? Would the rebels have conceded defeat? Who would have been president? General John Graves Simcoe, Bart.? 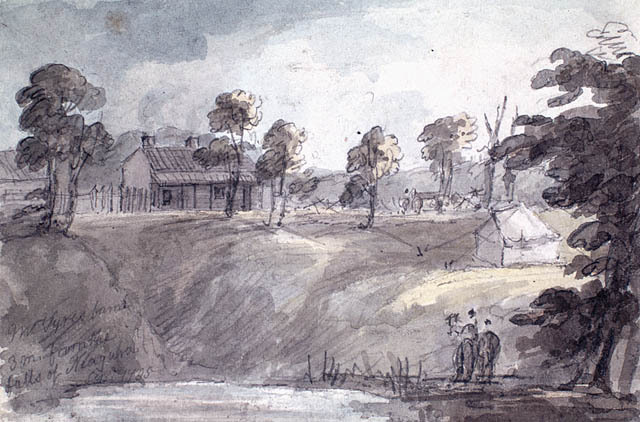 If that were the case, then the 1st first lady would have been Lady Elizabeth Simcoe, who is famous on her own as a watercolour artist, creating beautiful watercolours of her travels and sights she saw. How much of the history would have changed? Would slavery have even been an issue in Lincoln’s time, or would it have been history? Would there have been a civil war? I know the war of 1812 wouldn’t have occurred. What else would have changed? Moses Doan would have been honoured as a national hero, not shot dead in a tavern. His brother Levi, and cousin Abraham wouldn’t have been hung in 1788, just after the Gov’t signed an agreement not to punish crimes of war. 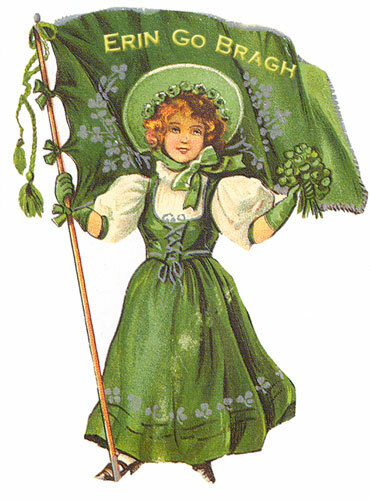 My Loyalist ancestors would never have left their homes in New York and Pennsylvania, and I would probably not exist. What would the United States be like today? Would it be a warring nation or a peacekeeping nation? There would probably be a prohibition of handguns, like in Canada. Would the crime rate go down? Probably. There would be a universal health care system. Would the taxes be higher? Probably, due to costs of universal healthcare. There would probably be no need for NAFTA, most of the continent would be one country, sharing in all of the resources. Would we all be better off, I dont know, I know I wouldn’t. * Can you identify male sibling(s) of your father’s mother, and any living male descendants from those male sibling(s)? If so, you have a candidate to do a Y-DNA test on that patrilineal line. If not, you may have to find male siblings, and their descendants, of the next generation back, or even further. 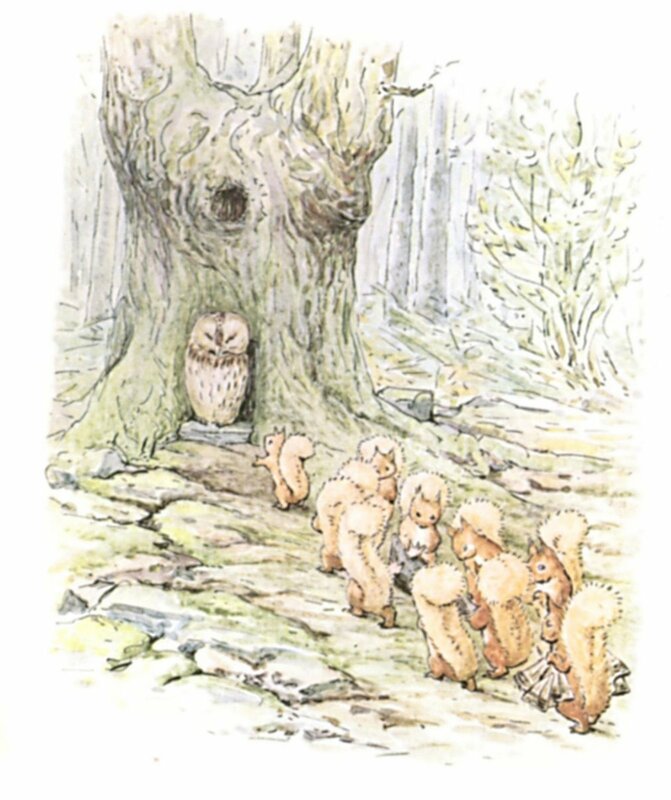 There’s more out there, after all she had seven brothers and six sisters, but only one has been in contact with me. Well, it looks like Big Brother is at it again, saving our children from poisoning their minds by books, not what’s written in them, they couldn’t care less what the book is about, they are more concerned with what it is made of, and the injuries that may result if they are eaten. I could understand if they were concerned with baby books, because these are likely to be in contact with their mouths, but all childrens books, come on! Kids are exposed to more lead out in the playground than they are in the library. What will the future hold for these young minds, after all, they are the product of their parents, who were allowed to read poison books and play with poison toys, and were so ill-affected by these products that they are normal. What should be considered is the harm that not being exposed to these books will have on our children. A lot of them have life lessons in them, about sharing and caring, and how to get along with others. I think we should encourage them to read more books like these. How many studies were done beforehand to see if there were any ill effects of handling these books, like they did for eating fish. The government doesn’t regulate what we eat as well as what we are in physical contact with. How about this “read as many new books as you like but those printed before 1985, you have to limit to one or two a month”. I’m glad that I don’t live in a country that won’t allow a child to read a childrens book, or play with a toy that was passed down from one generation to the next, yet. 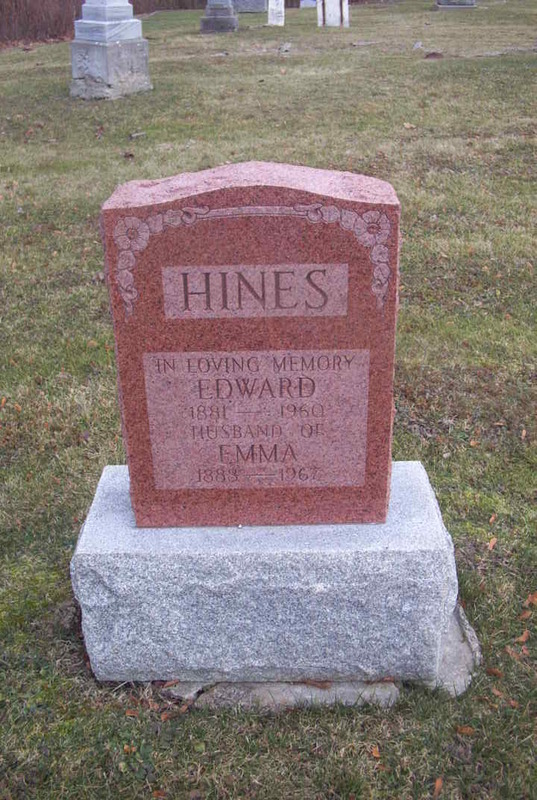 I was at the Wiki barn-raising, and I made some contributions, I have been organizing my family reunion this summer, so I decided to do this topic. While looking for links for that, I stumbled across a Family Website builder, FamilyLobby.com. Can change any information on the site and update any member’s profile. Can post news, journals and photos. Can view e-mail addresses and mailing addresses. Can edit their own profile. Can edit their own profile along with their spouse and children. Cannot view e-mail addresses and mailing addresses. Restricted member (View only) Cannot post news, journals, photos, comments, or any other information. Cannot view e-mail addresses and mailing addresses. Can vote. They offer free family (or group) websites with a variety of themes. 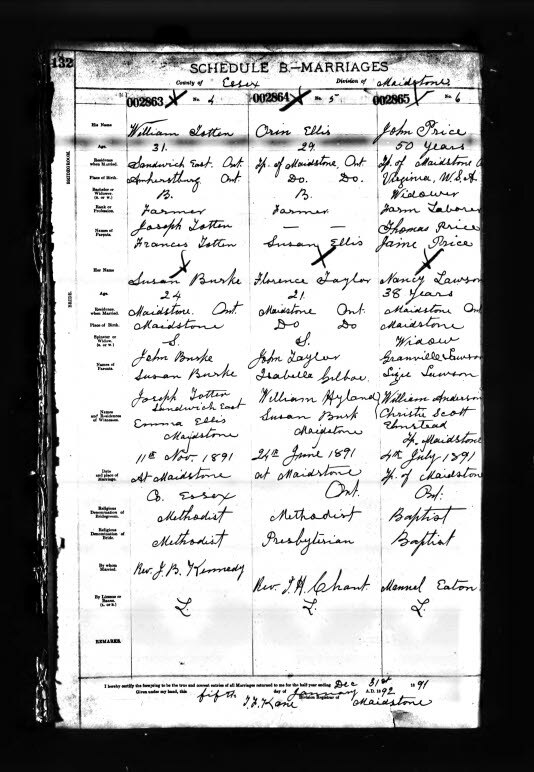 There is a limit in the free site of 30 members and 50 members on the family tree. There is also a storage limit of 100MB. You can set a free site up in a couple of hours, and make the different sections public or private. I have the Homepage and News public, everything else requires a log in. There are some public pages also, a Public Forum, For Kids, and Online RSS. I added a couple of links to the For Kids, I’m going to add more when I come across them. Since I have a large family, 51 members, the newest born yesterday, I had to get the upgrade. With the upgrade for less than $5 a month, I got unlimited members, unlimited family tree, 3 GB of storage, more customization options etc. With the paid version, I was able to put a flash introduction on the site and optional header. I made a few custom pages which can have a totally different look than the website, and sections that have the website background and template, which all members can add to. I am going to make custom pages for the members who want them, also. Now, back to the family website, I found some Google gadgets and put them on a special section for my family to use either on the page, or copy & paste the code into any box except the Guestbook, discussions and comments. Gadgets like games, Youtube players, MP3 players, clocks, MSN Messenger etc. I sent out the first Monthly Newsletter the other day, you can add different sections to the Newsletter from the website, News, Photos, Recipes, etc. I sent them out to every family member with an email address in a mass mailing. It didn’t take long at all, about 30 minutes. You can send out Special Editions as well, in between, if needed, or send online messages to any or all members that will be available to read online in their in-box as well. If there are any new messages, you are notified by a new message with icon in the menu bar. There is a private chat room as well. I will upgrade again, if I find we need more than 3GB of storage, with the upgrade we will be able to have our own domain name free, I have the option of buying a domain name now. We will also have unlimited storage. 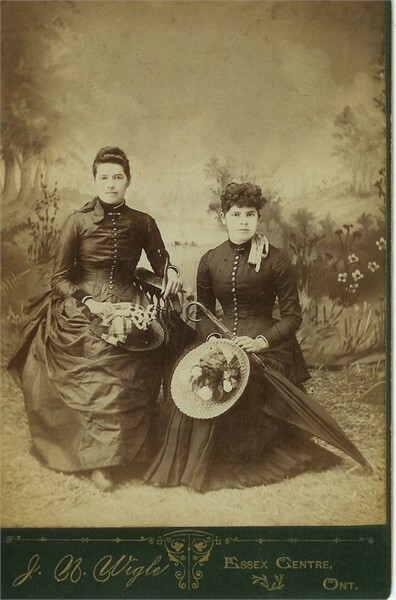 Here is a photo of my 3rd great-grandmother, Jean Taylor McDowell’s nieces, Mary Jane and Florence Bell Taylor. 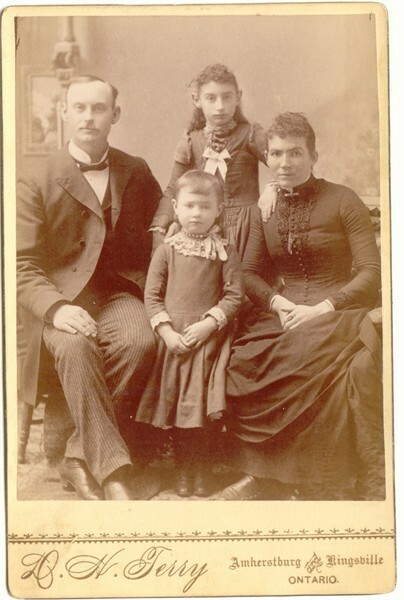 The photo was taken about 1890, Florence was married in 1891 at the age of 21 to Orin Ellis. 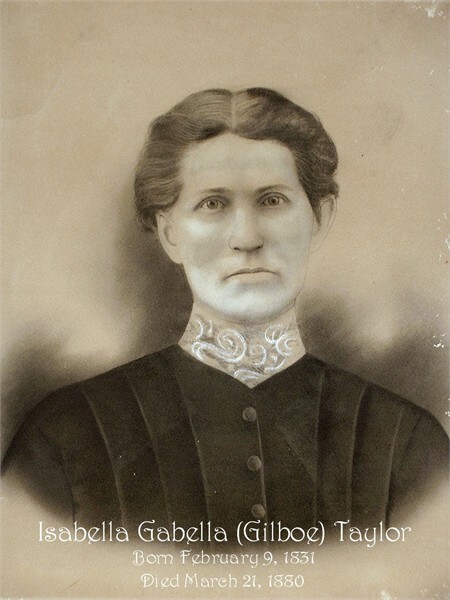 Mary Jane Taylor married Robert Ellis. Their parents were John Taylor and Isabelle Gilboe. 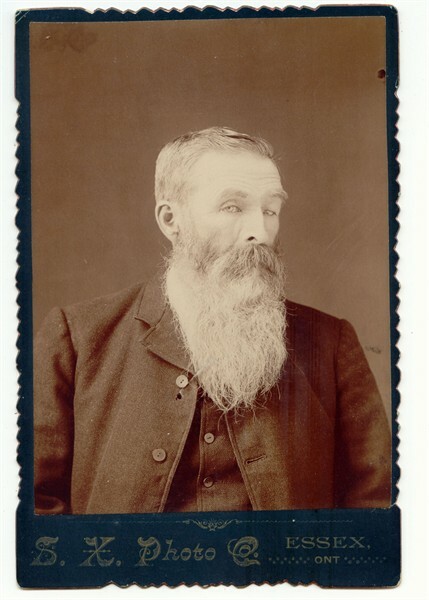 Photos courtesy of ClanTaylor at Ancestry.com. 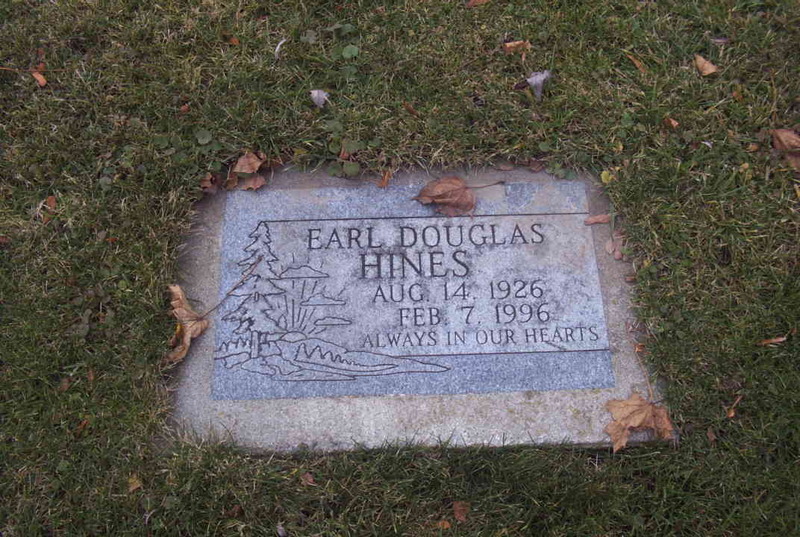 There are several resources on the internet that allow you to be creative with your genealogy. No, I don’t mean creating lost ancestors, or fabricating your family history, I am talking about how you present your genealogy for others to see. You can be as simple or as elaborate as your imagination allows, with the Digital Photo applications available today, or, if you aren’t feeling inspired to create on your own, you can let the applications assist you in your creations. I like using Scrapblog for creating scrapbooks. 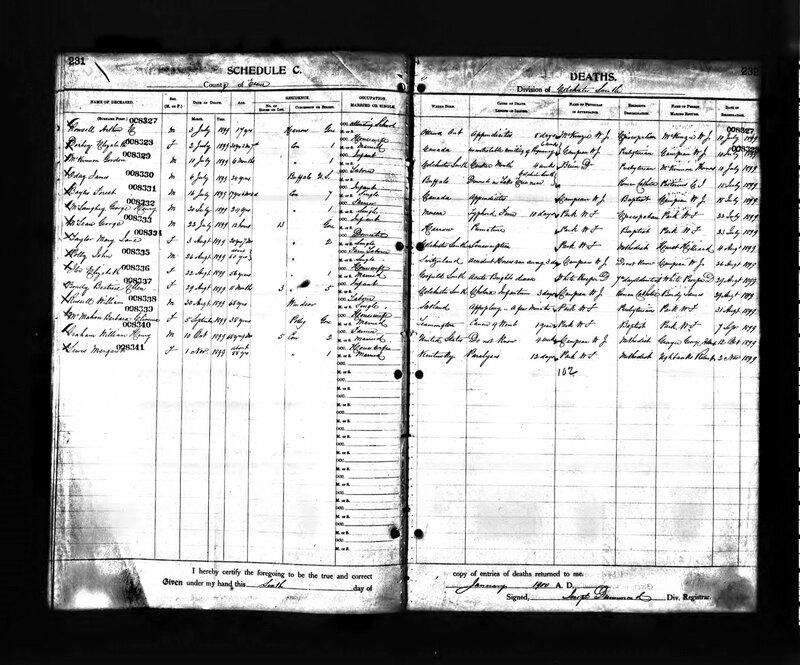 It is a free online program that is very versatile, I use it often, read more about ways I used Scrapblog for my genealogy. My grandparents, Wm. Edgar Hines and Josephine Desbiens and my aunt Evelyn. 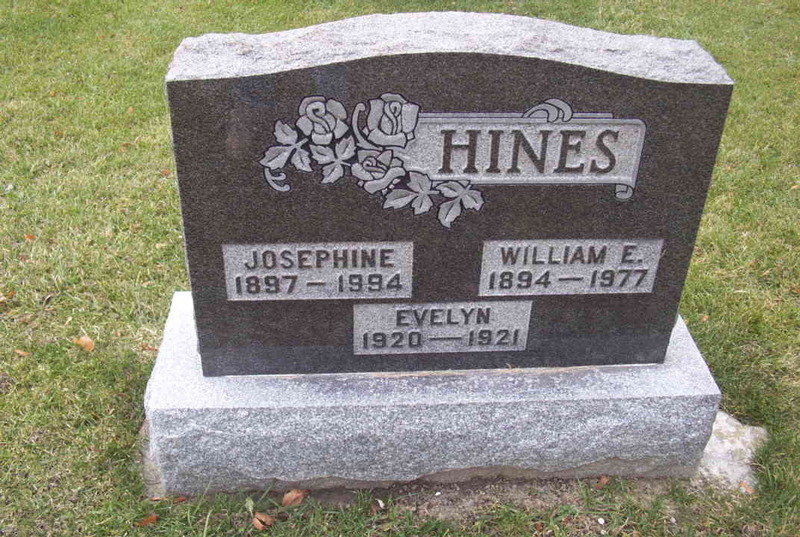 My great-grandparents, John Hines and Harriet Doan and my grand-uncle, Wm. 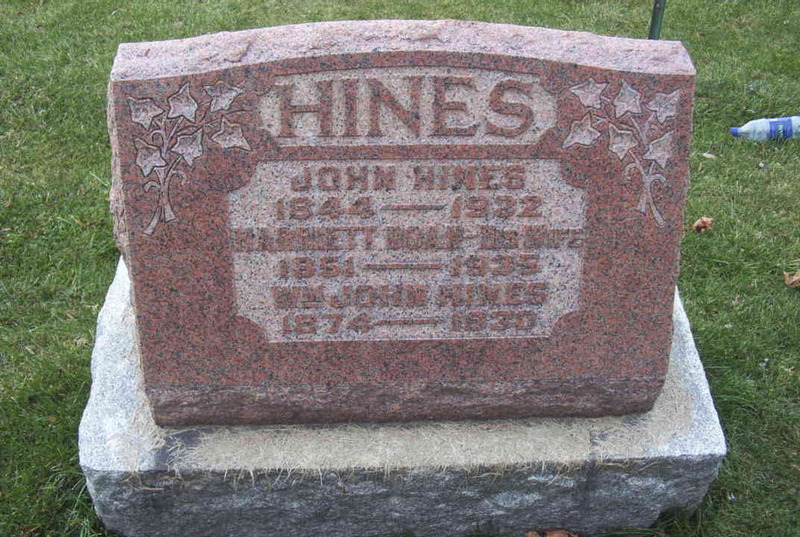 John (John) Hines. 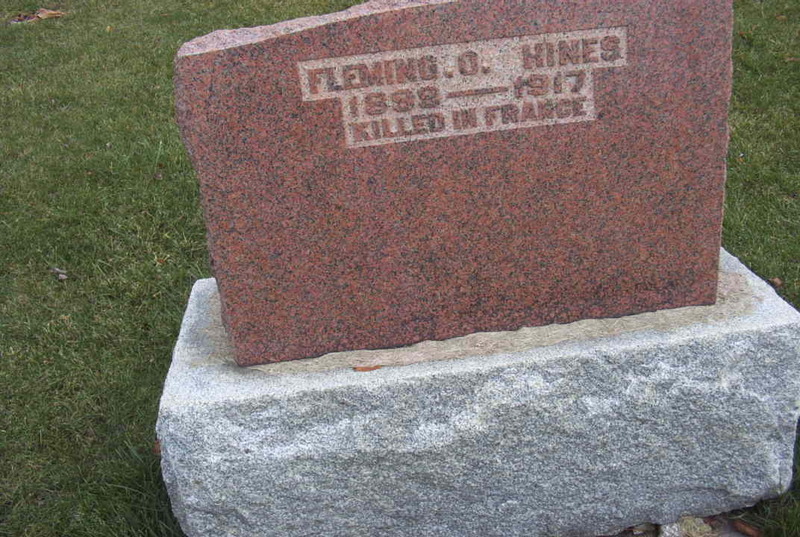 Memorial to my grand-uncle, Fleming W. Hines. 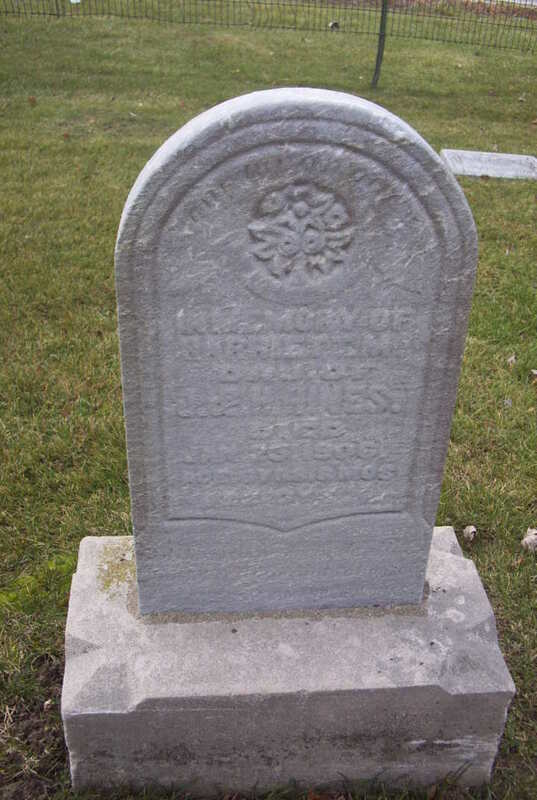 The property was donated to the Woodslee United Church by the Jariett Family.